Tag line: "What a joy! It's M-G-M's Technicolor musical!" 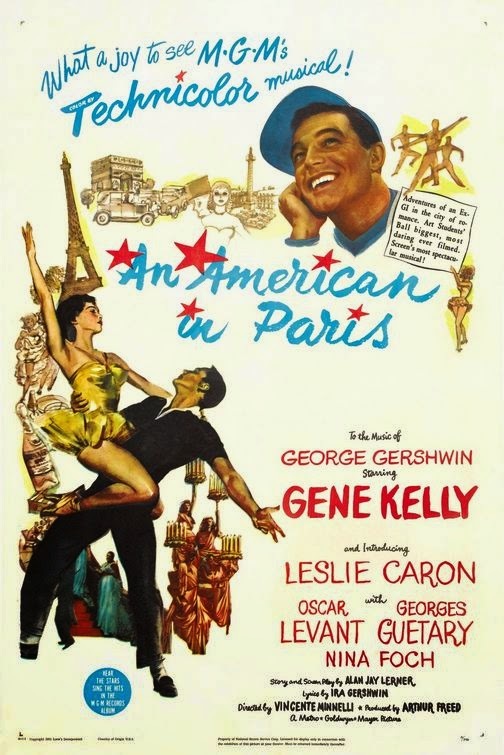 Normally, the best scenes in any movie musical involve singing and dancing, and while 1951’s An American in Paris certainly has its share of extraordinary musical numbers, it’s the performance of star Gene Kelly that drives the film, making it worthy of our undivided attention even after the music dies down. American Jerry Mulligan (Kelly) is an ex-GI who hung around Paris after the war ended to pursue his passion for painting. Alas, neither Jerry nor his good friend Adam Cook (Oscar Levant), a concert pianist who lives just next door to him, have been able to carve out a living for themselves, and must beg and borrow to survive. Jerry’s luck finally changes when he meets Milo Roberts (Nina Foch), a wealthy American who takes a liking to both Jerry and his paintings, promising to feature him in an upcoming art exhibit that could put him on the fast track to fame. The situation becomes a bit more complicated, however, when Jerry falls in love with pretty French girl Lise Bouvier (Leslie Caron), not realizing she, in turn, is engaged to his friend, singer Henri Baurel (Georges Guetry). An American in Paris owes its success to a number of factors. First and foremost is the music of George and Ira Gershwin, which perfectly complements both the film’s story and its Parisian setting. Looking very young, Leslie Caron is positively charming as Lise, an innocent girl trapped in a difficult situation, and Oscar Levant as the oft-depressed best friend / concert pianist has his share of funny moments. But what propels An America in Paris into the ranks of a classic is the work of Gene Kelly, who belts out a number of fantastic Gershwin songs, including “I Got Rhythm” (accompanied by a collection of French urchins), and the incredibly upbeat “S’ Wonderful”, performed as a duet with Georges Guetary. Aside from being the film’s star, Kelly also devised the movie’s excellent choreography, which is on full display in the grand finale, an extended dream sequence that guides us on a magical tour through the streets, and even the history, of Paris. The fact that Kelly handled the film’s musical routines with such ease is no great revelation, yet what truly impressed me was his overall portrayal of Jerry, who’s just as charismatic in the movie’s quieter moments as he is when the music swells. A vagabond traipsing through life with a smile on his face, Jerry is one of those guys you can’t help but like, and when Lise abruptly has a change of heart about Jerry, finding him annoying one minute and irresistible the next, we don’t question her motives for a second. To know Jerry is to like him, and it’s the energy Kelly brings to the role that makes the character so damn endearing. Gene Kelly was, without question, one of Hollywood’s best song and dance men, but in An American in Paris he proves to the world he was a terrific actor as well. Winner of the Academy Award for Best Picture, An American in Paris is a vivacious musical, a touching love story, and, ultimately, a showcase for its star, who pulls out all the stops to make it one of the greatest films of the 1950’s.